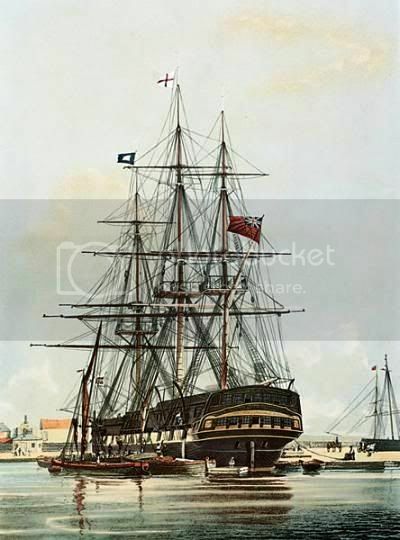 In May 1815, a British East Indiaman, the Arniston, was rounding the Western Cape of Africa on a mission of mercy I guess repatriating wounded solidiers from Ceylon back to England....this ship did not have a chronometer aboard in those days this was a very expensive instrument so it relied on other ships in its convoy to calculate its longitude.separated from its convoy in heavy seas, the Arnison was relying on dead reckoning to navigate.so the ship's master steered north for St Helena figuring he was a 100 miles or so west of the Cape...sadly he had made an error which was a very expensive one and wrecked the ship on the rocks at Waenhuiskrans. Only six of the 378 souls on board survived. The image reproduced here is of a similar ship. The survivors spent several days on the beach before being discovered by a farmer's son a memorial was erected on the beach by the wife of Colonel Giels, whose four unaccompanied children were lost in the tragedy.a replica was erected in later years and can be seen today The memorial bears the following inscription Erected by their disconsolate parents to the memory of Thomas, aged 13 years, William Noble, aged 10, Andrew, aged 8 and Alexander McGregor Murray, aged 7 (the four eldest sons of Lieut Colonel Andrew Giels of H.M. 73rd Regiment) who, with Lord and Lady Molesworth unfortunately perished in the Arniston Transport, wrecked on this shore on 3rd May, 1815. Over the years, the wreck's name has become synonymous with the place name, and today Arniston and Waenhuiskrans are used interchangeably At first it was only a fishing community now it has now become a renowned holiday destination and wine farming area. The fishing village - recognisable for its lime-washed and thatched houses - remains intact and has been declared a National Monument in its entirety. Fishermen still take the original style boats out, although now under contract. Whale watching is a popular seaside tourist activity.The Arniston Hotel is a popular tourist destination that looks out over the ocean. This link here gives you some info on what it is like now The closest major town is Bredasdorp, 24km to the north. The Overberg Test Range is situated adjacent to the town.